Exposed – Former President Mahinda Rajapaksa’s Political Hypocrisy and Double Standards On the New Constitution and Greater Devolution. Sir, I rise to a point of Order. ගරු සභාපතිතුමනි, අද මේ මොහොත වන විට ත්රෛoනිකායික මහා සංඝරත්නය -මහානායක හාමුදුරුවරු-, පූජකතුමන්ලා ඇතුළු සියලුම දෙනා විරුද්ධ වෙලා තිබෙන, සම්මත කිරීමට බලාපොරොත්තු වන නව ආණ්ඩුක්රකම ව්යසවස්ථාවට මගේ විරෝධතාවත් පළ කරමින් මම ආණ්ඩු පක්ෂයෙන් ඉවත් වී විපක්ෂයේ අසුන් ගන්නවා. Hon. Sumanthiran, you may continue with your speech. We have said “two main parties” for the reason that as the Hon. Leader of the House correctly pointed out that any resolution to the national question so far was not possible because one or the other main party opposed it. Today, we have a historic opportunity. Not only are we saying that in the interest of reaching a consensus, we will be willing to consider the main points in the main report, but the two main parties are also together having formed a National Government primarily for the purpose of giving to this country a new Constitution. Sir, on this question of a new Constitution, there are many views that are being expressed in the country. At the Presidential Election that was conducted in 2015 January, the common opposition candidate made his position very clear that he will abolish the Executive Presidency. That was the first promise that he gave this country on the day that he announced himself as the common opposition candidate. He gave three promises. This was the first one. He also said that the electoral system will undergo a radical change. Now if these are to take place, those must have the approval of the people at a referendum and some of those changes were sought to be brought in through the Nineteenth Amendment to the Constitution and the Supreme Court in its determination ruled that certain proposed amendments needed the approval of the people at a referendum. On the day the Nineteenth Amendment to the Constitution was adopted in this House with only one Member voting against it, it was repeatedly assured by the then Minister of Justice who led the discussion during the Committee Stage and the Hon. Prime Minister that the Nineteenth Amendment was only a stopgap, it was only an interim arrangement and a new Constitution would be made when the new Parliament is constituted. This appears in the Hansard of that day several times in the speeches made by Hon. (Dr.) Wijeyadasa Rajapakshe, the then Minister of Justice and the Hon. Prime Minister. This was a promise given by His Excellency President Maithripala Sirisena and the UNP at the election. I want to table*, in the House, that page of the Hon. Mahinda Rajapaksa’s election manifesto in January, 2015. Therefore, the mandate of the people of this country is overwhelming. Ninety seven per cent of those who voted on the 15th of January, 2015 have voted for a new Constitution to be formulated by converting this House into a Constitutional Assembly and enact a new Constitution for this country. He said, “සභාව,” it states, “Council” in the English translation of his manifesto, which is the same thing. Never before has there been such a massive mandate. Now a few individuals who stand on the streets are trying to deny the 97 per cent of the people of this country their right to enact a new Constitution. Where in the world you have a mandate of 97 per cent of their people telling their representatives to enact a new Constitution for the country? That is a mandate upon which a new Resolution to form a Constitutional Assembly was placed in this Parliament on the 09th of January, 2016. That was debated. That was debated on four separate occasions: on the 09th of January, 2016, two dates in February and finally on the 09th of March, 2016. On the 09th of March, 2016 that Resolution was adopted in this House unanimously – without a vote. Until then, there was a good professor of law, who has now become a president of a new political party, who was holding press conferences saying, “If you start a process to draft a new Constitution, that would be illegal.” But, after the 09th of March, 2016, he has not said a word about that, because persons who are aligned with his new political party are also Members of this House who did not murmur, did not raise one voice and did not ask for a Division when that Resolution was adopted. That Resolution was adopted in terms of Articles 74 and 75 of the current Constitution and that was what Hon. Mahinda Rajapaksa as the Presidential candidate also said; in line with the present Constitution, that he would draft a new Constitution Bill and present it to this House. The Resolution that we adopted unanimously lays down the procedure very clearly as to what will happen. It talks about a Steering Committee consisting of 21 Members; it talks about a Committee of Experts; it talks about six Subcommittees; it talks about an Interim Report that we presented to this Assembly and then, it talks about a Final Report together with a Draft Constitution Bill. A Draft Constitution Bill has a particular meaning in our Constitution. A Draft Constitution Bill is one that seeks to repeal the current Constitution and replace it with that Draft Bill. That is what it means. That is, Parliament shall not make any law repealing the Constitution as a whole, such law also enacts a new Constitution. Let the Hon. Sumanthiran continue. You can raise it in your speech. Anyway, what is your point of Order? My Friend, Hon. Sumanthiran is misrepresenting the facts. Sir, that is not a point of Order. That is not a point of Order. That is what I say. If the Hon. Member wants to say otherwise, he can say that. I have tabled that document in the House. So, all the Hon. Members of this House had the opportunity to call for a Division to object to that Resolution but none of them did so. All the steps in that Resolution were being followed to the letter. The Steering Committee was appointed unanimously by the Constitutional Assembly. Every expert was named was approved unanimously by this Assembly. The Members and Chairmen of every Subcommittee were approved unanimously by this Assembly. No one dissented; not a single Member dissented. And all different political parties have been accommodated in the Steering Committee. That, and the level of participation are borne out by the Steering Committee Minutes. Since I am a Member of the Steering Committee, I have the Minutes here with me. If we take the level of participation, the Hon. Leader of the House was pleased to thank a certain Member in the Opposition ranks and these Minutes will show how much he and the other Member from his side have been involved in the deliberations of the Steering Committee. Almost, I would say, 20 per cent or more of the entire contents of the Minutes are about their participation. Hon. Chairman, I just want to make a correction. Hon. Member, correct it in your speech. 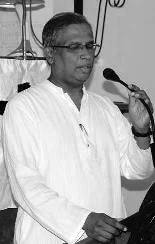 Hon.Sumanthiran, you may continue. So, they were given an opportunity to submit their views in writing within one week. They had not done it. The Hon. Keheliya Rambukwella, who disturbs me now, signed and gave his own proposal to the Steering Committee, which, after some time, another Member of the Steering Committee, the Hon. Dinesh Gunawardena, said he was withdrawing. It has all been minuted. On behalf of me, he withdrew that. No, that is all right. I am only talking about the involvement or the level of participation of Members in this whole procedure. So, I am saying it now in the public because giving a different view to the public that some people have nothing to do with this is false and all of this has been considered. Now, Sir, coming to the position that our party has taken, I want to say a few words before I conclude. We have very clearly stated that Sri Lanka shall be a secular State and I say this with responsibility: any Constitution that seeks to treat all of its citizens as its equals must be a secular Constitution. I am not a Buddhist and I cannot be told that I am second class in this country. A Constitution that gives a particular religion the foremost place cannot be a Constitution that treats all of its citizens as equals. Now, it is up to this House to decide whether you want a Constitution that does not treat all of its citizens equally. Even having said that that should be the ideal, we have gone on to say, but, if the Buddhist people wish that a certain status be given to Buddhism, we will not stand in the way. But, it is an indefensible position for the Buddhists to take. We, who are non-Buddhists, are saying, we do not mind it being given a foremost place. But, how will a Buddhist say, our religion must have the foremost place; others can have other places? How can any Buddhist who defend equality ever stand up and say that? But yet, if you want it, we have said, we are willing to grant it. We have very clearly said that Sri Lanka must be a federation – a Federal State. I want to say a few things about this idea of a Federal State. There is a wrong conception or a wrong view that has been spread in this country that the call for federalism comes from the Tamil people because they want to separate from this country. Nothing can be furthest from the truth. The federal idea was introduced to this country by the founder of the Sri Lanka Freedom Party, S.W.R.D. Bandaranaike in 1926. There were six letters that he wrote to “The Ceylon Morning Leader” on federalism. There was no SLFP at that time. That was as an individual. All Members will get an opportunity to express their opinion. So, please let the Hon. Member express his views. In that, he categorically states that Ceylon must be a Federal State. I am tabling* all of those six letters that S.W.R.D. Bandaranaike wrote to the newspaper in 1926. Not only that, the Left of this country in 1944 held the same view. Even before that, the Communist Party made a resolution that the country must be federal. The Pieter Keuneman – A. Vaidialingam Report of the Communist Party of 1944 very clearly articulates that Ceylon must be a federal country. Sir, I am tabling* the Pieter Keuneman – A. Vaidialingam Report of the Communist Party also. I am saying all of this to show that the call for federalism came from Mr. S.W.R.D. Bandaranaike, Mr. Pieter Keuneman, Mr. A. Vaidialingam and more importantly, from the Kandyan Chiefs in the 1930s before the Donoughmore Commission and later in the 1940s, before the Soulbury Commission. They articulated three units with the North and East as one unit. So, those who oppose federalism and those who oppose the North and East Province as one unit must remember that that proposal came from the Kandyans first, not once, but twice before two imperial commissions. So, you all must disabuse your minds of the view that this is somehow a Tamil project, a first step to separation. No, Sir, we have very clearly stated that the country must remain one. We have said that very clearly. We are participating in this process in the most responsible way possible and we ourselves have said that the country must remain one. Our view is that if the country is to remain one, different peoples in this country must have a share of the governance of this country. It cannot be a system of government in which simple majoritarian rule prevails. This country consists of different peoples and it is in order to remain as one that we are seeking maximum possible devolution of power; maximum possible power sharing arrangement so that all the peoples in this country have a share in that. Otherwise, sovereignty, which is said to rest in the people, will become meaningless; sovereignty will be exercised only by one majority, one people of this country, if it is a simple majoritarian rule. So, one must understand, the country must understand, the reason why we are asking for sharing of power. The reason why we are asking for sharing of power is so that we can be proud of this one country of which we are citizens. We do not want to be second-class citizens. Nobody in the world wants to be second-class citizens in any part of the world. If we are to be proud of this country, we must have equal stake in this country. We must be able to say we are proud to be Sri Lankans. I must be able to say I have equal access to government power and I am treated as an equal in this country. Until we are treated as equals, not by mere words, but actual access to government power being given to our people, we will never be in a position to say we are proud of this country; we will never be in a position to say we are Sri Lankans. Many in our community have left this country today and they are not proud to call themselves “Sri Lankans”. They call themselves “Canadian-Tamils”, they call themselves “Australian-Tamils”, because they have been driven out by violence from this country. They have been denied the due share that they must have in the government of this country. That must change. The reason why the Tamil National Alliance participates to this level in this Constitution-making process is to change that, to erase that bitter past so that we can, together with you, say our language is equal – that was corrected in 1987 but must be implemented in full – our religions are equal, no foremost place to anybody, everybody is foremost in this country; we must be able to say we have due share in the governance structures of this country. Today when the provincial council elections are postponed, it is he and Members associated with him who are protesting and saying, “Do not postpone the provincial council elections.” The man who said, “Country will divide if you create provincial councils”, is screaming his head off today saying, “Do not postpone provincial council elections. That is the violation of our sovereignty”. Professor GL Peiris’ petition to the Supreme Court on which the Determination on the Twentieth Amendment was made, was made on the basis that a postponement of the provincial council election affects the sovereignty of the people and they do not want it postponed. So, the creation of provincial councils has not resulted in the country being divided. The country has not been divided. I also have with me the 2000 August Draft Constitution Bill that was brought to this House by the People’s Alliance Government of that day of which the Hon. Mahinda Rajapaksa was a Cabinet Minister; a Bill which was certified by the Cabinet of Ministers as a Bill that is intended to be passed by this Parliament by a two-thirds majority and approved by the people at a referendum. He was a Cabinet Minister who approved of this Bill and what does that Bill say? These proposals before us today says, we are one country. Therefore, we can call ourselves, “ඒකීය රජය”, meaning of which will say, “ஒரு நாடு” or “ஒருமித்த நாடு” – “one country.” This does not even say that. This says, “Sri Lanka is a Union of Regions”. All the Cabinet Ministers at that time supported this, in this House. The UNP supported that principle. The UNP burned a copy of this Bill in this House because there was a transitional provision with regard to the Executive Presidency, not because of power sharing, not because of change of status of the country. There was a wide consensus not only in August, 2000. Thereafter, when the Hon. Mahinda Rajapaksa became the President of this country, he formed the APRC. He told the APRC that there must be maximum possible devolution in his speech when he addressed the inaugural session of the APRC. Where is the APRC Report? The APRC Report says, “Do not have a Concurrent List.” It says not to have a Concurrent List and that powers must be clearly divided. That is the Report that came out of a process that the Hon. Mahinda Rajapaksa as President instituted. But what do our proposals say? We say, we have no objection to a short Concurrent List. Now, why do you say that the country is going to be divided by this? When you were in power you approved of a Draft Bill that went far beyond, far beyond what is contemplated by this Interim Report. Is it not to mislead the people of this country, and stall, and prevent a final resolution to the national question that has plagued this country ever since Independence? Do we not want a reasonable resolution of this? If you ask the question what is the biggest problem this country has faced, obviously it is the national question. This country has not faced a war for three decades on account of anything else, not on account of any other issue, it is only in regard to these issues that actually parts of the country were ruled by others also for parts of time. So, we are now in a process. As responsible representatives of our people, we are Tamil Members of Parliament from the North and East – except two, all others belong to the Tamil National Alliance – we have an overwhelming mandate from our people to resolve this question within a united, undivided country and we have gone one step further and said, indivisible country even in the future. So, when we are participating like that, our people have misgivings of this Interim Report. Our people are saying, “We told you it must be a Federal State”. Our people are saying, “There must be one unit of devolution”. Our people are saying, “It must be a Secular State, is it not a reasonable thing? You are compromising beyond the mandate that we have given you”. They are right. We do not want to compromise beyond the mandate given to us, but we want to see that through negotiation a reasonable position is reached. Even at this point in time, it looks as so. From our people’s point of view it looks as so we are going beyond the mandate given to us. We are striving hard to achieve a consensus which we will put before our people, which, if we are satisfied, is a reasonable solution that addresses all the basic aspirations of our people. Then, we will go before our people; we will commend it to our people to accept it and our people will accept it if it addresses those issues. We had two full-day meetings yesterday. Our representatives had lots of misgivings about various matters in this Report. We will address them as we go along. But, our primary objective would be to come to a consensus in this country, so that there will be a Constitution of this country which all the people of this country accept as their own. Is that too much to ask? Can anything be said to be too heavy a burden to carry if we are to achieve that? All of us must put our shoulder to the wheel if we can achieve that objective. I am not saying that it is an easy objective to achieve, but we have come half way. We have come to a point where there is an Interim Report on which – although we disagree on lots of matters – we have clearly come out and said, if the main points are agreed to by the two main parties, we will consider agreement with that for the sake of consensus and for the future generations of our country. I invite all the Hon. Members of this Assembly – I am not saying this patronizingly, I am pleading with every Member of this Assembly to please, view this matter in that way. Do not put the lives of future generations of this country at peril. Think of what this country will be if we can achieve this. Of course, it must be achieved in a way that recognizes the dignity, equality of all the peoples of this country. Otherwise we will not agree. But, there is an opportunity to come to an agreement such as that and this Assembly’s deliberations today, tomorrow and the day after must be for that constructive purpose to go into the contents, place different propositions, listen to every shade of view and then, tell the Steering Committee, that you have heard all of this. Bring all this to fruition so that this country can march forward as one entity in which various, different people who speak a different language, who profess a different religion, who live in different parts of this country can all say, “We are Sri Lankans.” because our rights, our dignity, our equality have been assured in this document and this is our document.